Have you ever seen a real-life giant? If you’re a long-time wrestling fan, or an avid viewer of The Princess Bride, you probably know about Andre the Giant (or Fezzik, in the Princess Bride). And if you don’t know about Andre the Giant, well… all you really need to know is that he was a giant. Like–literally a giant human being. He was 7’4” and he weighed over 500 lbs. Why does Andre’s size matter? Because we’re talking about sizing and scale, people! And beer cans look so small in his massive hand! His hands are considerably larger than the hands of the vast majority of the human population. So when you see something that’s ordinarily bigger than a hand look small in a hand, it looks off. In real life, this sizing is hilarious. In a game, it could end up being hilarious. Or jarring. We’ve survived for most of our evolutionary lives through our ability to recognize patterns. We know when things aren’t quite right because that’s how we stayed alive. Don’t expect people to ignore it or miss it–if the scale or sizing is off in your game, the players will know! What can you do to get your sizing and scale to work for your game? Size refers to something’s dimensions–how big is it? 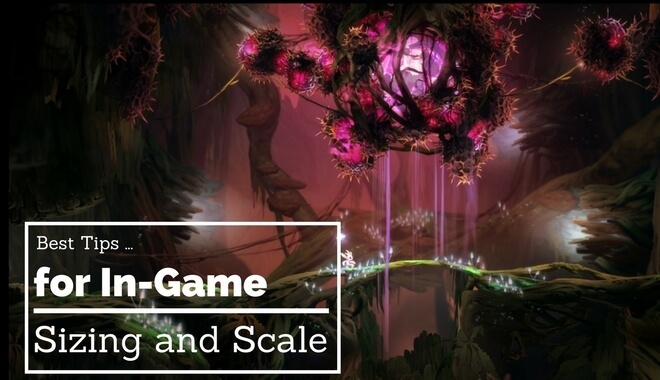 Scale refers to the relative size of something, whether it be the characters, objects or the game world itself. Different types of games will require different adherence to the rules of size and scale. If you’re going for a realistic game, it makes sense that your in-game rendering would mimic the scale with the real world. That means that the size of a character in your game relative to the size of any objects, buildings, or vehicles in your game should be close to real-world scale. Real-life scaling can potentially cause some problems. One issue is that it just doesn’t always look good. Objects can be too small to see clearly. Maybe an important feature on a character (like a face–the hub of emotional displays!) is too small for the players to see the expressions. If you need to make objects or character features larger in order to improve the player experience, you should do it. This isn’t an uncommon practice, but the key to pulling it off successfully is consistency. You need to develop a consistent sizing system for your game. Consistency does a few things. First, it helps to maintain the suspension of disbelief. Suspension of disbelief is why movies like Lord of the Rings and Guardians of the Galaxy make sense to us as viewers. We know that there aren’t rings of power or stones of power in real life. Bargains with cursed ghost armies just aren’t being made in 2017 (mostly because the orcs haven’t marshalled their forces and marched against us. Yet). And we aren’t having intergalactic space battles with humanoid species spanning planets and lightyears. But we suspend our attachment to realism for the sake of our own entertainment. We willingly give in to the lore of these stories. For a few hours at a time, we adopt this alternate set of truths. We suspend our disbelief. This happens in video games, too. It’s how we lose hundreds of hours to games like Skyrim, World of Warcraft, and Horizon: Zero Dawn. So if you’re going to mess with the sizing and scale in your game, do it for a reason, and do it consistently. If you break your own rules, you’ll snap your audience back to reality (if no one is a giant, don’t all of a sudden give someone can-dwarfing giant hands–elements in your game should be the same relative size to each other, unless your plot is based around things changing size). If that happens too often, you’ll lose ‘em. That’s why uniformity in the scale of your world is important. Now, just because you need to be consistent doesn’t mean you have to be realistic. If the idea behind your game isn’t rooted in reality, you can make things whatever size you want. Ori and the Blind Forest has the player take control of a forest spirit. In the game they made the forest spirit small, but it could have been any size. The trees in the forest are impossibly large. They seem beautiful, ancient, and totally unrealistic. But it’s consistent, so we don’t need it to be rooted in reality to enjoy it. Disbelief suspended. If you’re playtesting your game and the sizing feels off, tweak it. Like we mentioned, “real life” scale doesn’t always transfer well into video games. Objects might feel too small or too big. Just as with game physics, the sizing choices are ultimately the designer’s call. In certain games the players are pretty big compared to the environment. Ogre Battle 64 is our favorite example. The character avatars are giant as they walk around on the map–they’re as big as the “castles” are. Because the player needs an aerial view of the map, the camera has to be high up, almost birds-eye. If everything was to scale, it’d be impossible to see any details of the characters or the enemy avatars. The solution was to make the character avatars giant. Character sizing is an interesting component of character (and game) design. Size can be used to show power, to inspire awe, to strike fear, or to elicit other emotions. The size of characters in your game can function as helpful visual clues for your player. In Overwatch, for example, the tanks are all pretty large in size. From a function standpoint this makes sense–tanks are damage absorbers. They’re supposed to draw the fire and attention of their enemies. Being big in size means they’re easier to spot. It also means they can, theoretically, block more damage than other characters (since there’s more of them to hit). Size can be used to show power, too. Think about boss fights in games like Horizon: Zero Dawn or Breath of the Wild–the enemies can be huge compared to the character you control as the player. It adds weight to the challenge and some excitement, too. Small characters can go either way. In a game like Left 4 Dead, the Witch is the smallest character. But she is also extremely dangerous. In Bioshock, the little sisters are practically harmless….but they have giant characters, the Big Daddies, looking out for them, making them indirectly dangerous. Just like in nature–some small spiders can kill, others are totally harmless. If you know the rules, you can break them. But it’s better to break them for good reason. Let your instincts guide you, young master. If something looks off to you because of its size, chances are good that other players will notice it too. Keep them in a state of suspended disbelief.. Fix the sizing!